Ben Duckett admits missing out on a triple hundred on a sunny final day at the County Ground was ‘a bit of a kick in the teeth’. But the Northants star says he would happily have taken his 282 not out when the County Championship Division Two game against Sussex started on Sunday. 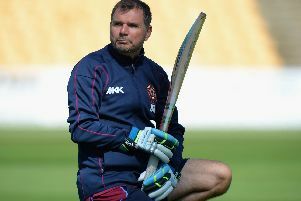 Duckett delivered a stunning innings, which is the eighth highest in Northants history. But he was denied the chance to try to surpass current record holder Mike Hussey, who hit an unbeaten 331 at Somerset in 2003. The umpires decided the outfield at the County Ground was too wet, meaning there was to be no play on days three and four of the clash with Sussex and the match was drawn. And Duckett said: “I almost would rather it was raining all day - it’s a bit of a kick in the teeth. “We just played football and I’m sweating. It’s really sunny, but the umpires had to do what they had to do. And reflecting on his innings, the 21-year-old said: “I’d have definitely have taken it at the start of the game!